Transportation is a critical component to planning a successful vacation. Since Orlando and Central Florida do not have a robust public transportation system, it is important that guests be aware of when they will need transportation and what options are available. From taxis, town cars, limos, shuttles, and even trolleys, in this article we will break down all of your options for getting around the United States’ top vacation destination. For a lot of visitors, a private car service is the best way to go. Our recommendation is to use our sponsor Quicksilver Tours & Transportation. They have a great reputation, fantastic reviews, and were kind enough to sponsor this page. For pricing, a towncar for up to four passengers traveling one-way to Universal is $70 ($125 round trip), a van for up to ten passengers is $80 ($140 round trip), Cadillac Escalade SUV for up to six passengers is $110 ($205 round trip), and a limousine for up to eight passengers is $130 ($240 round trip). All of Quicksilver’s rates include tolls, airport gate fees, and surcharges. There are no late or early pick-up fees, nor international arrival fees. There are no hidden fees. Your driver will meet you in the airport. Available car seats and booster seats are free of charge. There is no credit card needed to hold most reservations. Along with transportation, another big travel expense is food. That’s why a lot of guests prefer to rent accommodations with full kitchens, so they can prepare some meals and save money. But how do you get your fridge stocked if you don’t have a car? Quicksilver offers a free 30 minute grocery stop for airport round trips! For a limited time, Orlando Informer readers can get a free 30 minute grocery stop with an airport one way trip, too! Make sure you use the promotion code: OI/2015 when booking. For guests staying on-site at Walt Disney World, Disney offers complimentary transportation to and from Orlando International Airport by way of Disney’s Magical Express. You can visit this link to book the service and find out more information. You may also take a look at the Magical Express FAQ for additional information. 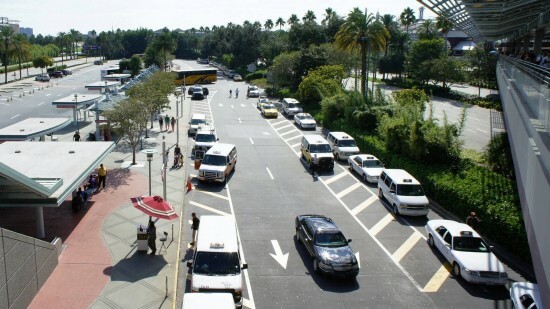 Transportation services lined up at Universal Orlando. Two important notes about Disney’s Transportation System: It only travels on-site. So, if you are going from park to park or if you are staying at one of Disney’s on-site hotels, it usually works out quite well. But it won’t take you anywhere off-site. Second, the on-site transportation system is available to anyone — you do not have to stay on-site to use it. So, if you want to spend the morning at Animal Kingdom and the afternoon at Epcot, you are free to use their transportation regardless of where you are staying. You can learn more by clicking here. While venturing off-site from Disney opens up an entire world of new attractions and accommodations, we cannot bring our free Disney transportation with us to Universal, SeaWorld, or International Drive. So now we will look at all the different options for getting around the rest of Orlando and Central Florida. The most economical way to travel around Orlando outside of the I-Drive area is by shared shuttle service. When going by this method, you will be in a 15-passenger van with other patrons. By combining your trip with others, you will be able to get discounted rates for the trip. This an excellent way to visit local attractions and also get out to some of the farther out spots like Cocoa Beach, the Tampa area, or Kennedy Space Center. Mears Transportation offers this service for $19-$21 for one-way adult travel for Disney/Universal from the Orlando International Airport. While going from the airport to the theme parks is the primary use for the shared shuttle service with Mears, other scenarios may apply as well. For example, if you are staying on-site at Universal or in the International Drive area and you’d like to visit Disney World, many times Mears will have a shared shuttle for this route. Check out this PDF file for more information. If Mears doesn’t work out Super Shuttle is another shared shuttle option in the Orlando area with similar rates. They don’t have a standard rate spreadsheet like Mears does, but I priced a one-way trip from the airport to Universal using their shared shuttle service and it was exactly $19, like Mears. As we mentioned above, with shuttles you are sharing the vehicle with other guests. These guests will likely be staying at different hotels than you. You will likely stop multiple times and multiple locations to drop off other riders. Keep in mind this can significantly cut into your vacation time. Like the options above, this is definitely not the quickest way to get to Busch Gardens. Visiting Legoland? You’re in luck Legoland offers a shuttle for only $5 – $10 from the Orlando Premium Outlets on Vineland Ave.
Something else to keep in mind before paying for a shuttle is that many hotels offer free shuttles to popular locations like SeaWorld, Universal Orlando, and Walt Disney World. Always check with your hotel first to find out what complimentary shuttles they offer. Keep in mind hotel shuttles are limited as far as departure times from the hotel and the parks, so plan accordingly. If you want the flexibility of coming and going as you please, a paid option is more likely to fit your plans. This is probably the most familiar option for most people. Mears is once again the largest provider of taxis in Orlando. They have a fleet of over 600 up-to-date cars with GPS. Keep in mind that for transportation from major destinations like the airport or any theme park via taxi, you do not necessarily need to make arrangements in advance. At these major destinations there are always many taxis waiting to pick up guests. Please note that this is for taxi service. If you want another service, like a shared shuttle or town car, you will definitely need to make arrangements in advance. Regarding taxis, use only metered taxis when at all possible. All of the Mears cabs (Yellow Cab Company, Checker Cab Company, and City Cab Company) are metered. If you have to use a non-metered taxi that is not one of the reputable ones listed previously you risk being overcharged. Finally, speaking of being overcharged, bear in mind that taxis will charge extra for stops and “caught in traffic” time. The time spent stuck in traffic can most definitely add up very quickly. Gray Line of Orlando is the option that probably receives the highest reviews. Starting at $99.00 you get round-trip transportation, tickets, and more for your visit to the KSC. They also offer tours and transportation to Cocoa Beach or Clearwater for around $75.00. Florida Dolphin Tours offers comparable tours and rates to that of Gray Line for the KSC. Starting at $99.00 for adults and $89.00 for children this is another great option for seeing the KSC and has also received great reviews. They also have similar beach excursions like Gray Line for Clearwater & Cocoa Beach and they both are $75.00 for adults. Finally, be sure to run the math all the way through to ensure you’re getting the best price and value!